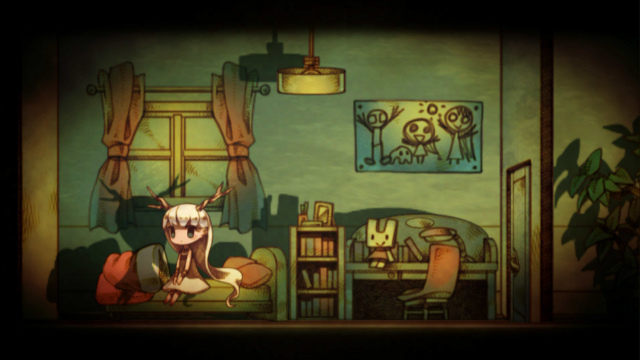 After playing htoL#NiQ: The Firefly Diary, I never want to look at another maze again. The Firefly Diary is all about confusion and mystery, hence the mazes. 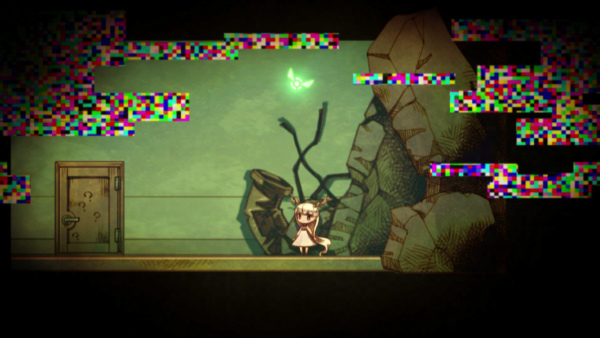 The puzzle-platformer for PlayStation Vita (out this week from developer/publisher NIS America) introduces us to Mion, a young girl with long, white hair and antlers growing from her head. She wakes up at the bottom of an underground labyrinth without a single memory of how she got there. We know as little about the world as she does, but you’ll soon discover that it’s not a friendly place. You don’t control Mion. Rather, you play as her two guardians—a green firefly named Lumen and a pink firefly named Umbra. By moving Lumen, either with your finger on the front touch screen or with the Left Stick, you can lead Mion in any direction. She’s helpless and needs your instruction to climb up or down ladders or to push objects such as boxes. I found myself fascinated with my surroundings. The ruins are empty, dark, and eerie, but they’re also beautiful, thanks to the gorgeous art style and the candlelight effects that cast shadows that shift and stretch across the screen as Mion walks. As you explore, you’ll collect memory fragments that cause the screen to glitch out. These treat you to a happy memory in cute pixel graphics, showing Mion in a loving home with a man and a woman who could be her parents or her doctors, given their scientific equipment and lab coats. It’s clear they care for Mion, and given her current situation, it’s hard to believe that her life was once so peaceful. That makes figuring out what happened all the more compelling. What turned this innocent girl’s reality into a nightmare? Mion is alone and afraid, and the environment is dangerous. You have to keep her safe from countless perils, including buzzsaws, pillars of fire, carnivorous plants, and shadow monsters with bright red eyes. The shadows are The Firefly Diary’s most intriguing feature, and they’re where the other firefly lives. By pressing the rear touch pad or by tapping the Triangle button to enter the Shadow World, you can move Umbra through and along the edges of shadows. Umbra is bound to Mion, so you’ll often need to position her in such a way that her shadow forms a pathway to other shadows so you can interact with different highlighted objects that are otherwise inaccessible. You might hit a lever or cut a rope, aiding Mion in the world of light. This sounds easy, but The Firefly Diary is one of the hardest games I’ve played in a while. Just because it’s a pretty game doesn’t mean it spares Mion from dying in painful or frightening ways, splashing the screen with her blood. Even though the shadow monsters exist outside of the physical realm that Mion occupies, they’ll kill her if they touch her. But physical forces such as falling rocks or blasts of air can keep them at bay. All it takes to kill Mion is one hit. 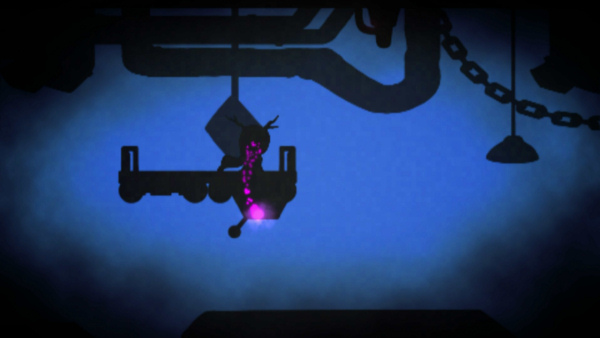 Keeping her safe involves a lot of trial and error as you solve puzzles and navigate her past obstacles. Timing is essential. You might have to line up shadows at the perfect moment or move Mion before she collides with a hazard like a rotating buzzsaw or a hungry monster. It demands a lot of patience and perseverance in a stressful 10 hours. You’ll easily die a hundred times. The bosses are no exception. I won’t spoil the few that there are, but they’re all incredibly cool and even clever with how you interact with the Shadow World to defeat them. But surviving these encounters is balls hard. I loved other challenges—like the forest of carnivorous plants, hanging bodies of dead girls that look suspiciously like Mion, and vines that grow toward Lumen’s light to form bridges. Another favorite of mine were the mushrooms whose exploding spores turn Mion into a zombie that walks on her own, away from Lumen, and usually straight into danger. More non-threatening than the world and its torture devices, but far worse to contend with, are the mazes. Oh god, the mazes. The Firefly Diary doesn’t really repeat itself with the same tricks, which is part of why I found it addictive and absorbing—and why, when it forced me to guide Lumen through a (second) maze where you can’t touch the walls or other obstacles, like electrified rods, I was both disappointed and determined to win. But these mazes took it out of me. They shouldn’t be difficult, but they are. The firefly’s hit box (the radius on its body that’s vulnerable to damage) is too large to navigate such a narrow maze easily, especially since its erratic hovering makes controlling it so challenging. Forget trying to use the touch screen—your finger just covers up what you’re supposed to be looking at. And the Left Stick just isn’t precise enough for the job. It’s agonizing. The controls get in your way, contributing to the difficulty. Too often I groaned as Mion did something I didn’t want her to do, like go through a door when I instructed her to sit (so I could move Lumen freely without her moving, too). Sometimes I would try to push a seed-spitting plant, whose bulbous head is attracted to Lumen’s light, and end up aiming its projectile right at her. These issues caused no end of frustration. Perhaps worse is that for all the energy you put in, you get little out. The story is nonverbal and elusive as a result. The Firefly Diary wants to remain a mystery, and it’s one that might be infuriating—and, if you’re prone to anger over super hard video games, give you heart palpitations for a week. 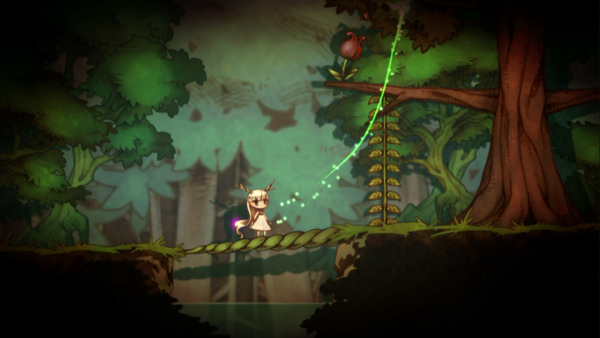 htoL#NiQ: The Firefly Diary is available for PlayStation Vita. Stephanie Carmichael writes about video games, comics, and books when she’s not helping teachers and students have fun together with Classcraft, an educational RPG. Find her on her blog or on Twitter.